Great Jaguar I-Pace car Leasing & Contract Hire Deals. Jaguar becomes the first of the premium brand manufacturers to make a long range, practical, battery-powered electric vehicle. If you can afford the £60,000 asking price, you might well have everything you could want here: a 300 mile driving range, 395bhp, potentially zero emissions and a car that might be as comfortable taking to a racetrack as to a gravelly ravine. Welcome to the I-PACE. Our Jaguar I-Pace Lease Deals. Would you want one? Perhaps a better question is 'why wouldn't you want one?' To which we'll provide some obvious answers. Firstly, clearly there's the premium pricing to consider. And secondly, despite the great job Jaguar's engineers have clearly done with the handling dynamics of this car, there's no way an EV weighing around 2.2-tonnes can respond and ride quite like a conventionally-engined fossil-fuelled rival. But all the signs are that this one gets very close to that benchmark. If you've been waiting for luxury EVs to get serious, your time may have come here. In the future, there will certainly be better battery-powered electric vehicles than the I-PACE, but we don't think that there are right at present. And we think that in future, experts will look back at this car as the one that made the EV concept properly credible for the premium buyer. Which makes it very significant indeed. It seems to have taken the posh car makers a long time to have got their heads round the concept of full-electric power. Yes, they've dabbled with plug-in hybrids and shown futuristic concepts at motor shows but in terms of products customers can actually buy, the Tesla Model S has had the full-EV premium market for large cars to itself for well over half a decade. But stand by Elon Musk: things are about to get a whole lot tougher. This Jaguar I-PACE delivers a Tesla-style 300-mile drive range but, thanks to proper 50/50 weight distribution and Jaguar know how, handling dynamics that owners of a Model S or a Model 3 could only dream of. Technology people can create an electric car. But only car people can make one like the I-PACE. We're looking forward to putting this I-PACE to the test; the prospects certainly look promising. The stuff you need to know here's quite straightforward - by electric vehicle standards anyway. 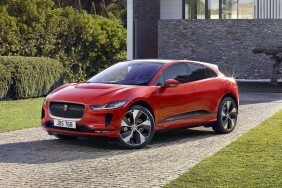 The 90kWh lithium-ion battery pack lies between the axles and Jaguar has specified two electric motors so that it could position the wheels for a perfect 50/50 weight distribution. They're powerful too, giving this 'performance' EV a 395bhp output. Rest to 60mph takes just 4.5s. Drive like that though and the claimed 300 mile operating range will be used up pretty quickly. You'd expect silent refinement and instant acceleration from rest from an electric car but, due to the heavy weight of all those batteries, less than stellar ride quality. Jaguar claims it's put a lot of work into that and offers I-PACE buyers a wide choice of suspension options. You can have passive or adaptive dampers or air springs with adaptive damping. An electric 4WD system is standard - one of those that can put as much or as little torque as is necessary to any wheel. If you were ever brave enough to try your I-PACE off road, you might be surprised at what it could do. Jaguar claims it would wade up to 500mm of water. In theory, the I-PACE is a kind of SUV. But you might equally want to see it as a coupe, a luxury saloon or even some kind of sportscar. Designer Ian Callum isn't bothered either way. At 4,682mm in length, this model is 10mm longer than Jaguar's XE; it's bigger than the larger XF saloon too, with a 30mm longer wheelbase and 15mm of extra width. There's more of a cab-forward stance than you'd get in a conventionally-engined Jaguar but the silhouette looks very agile in profile. And it retains a traditional big grille, even though the three independent cooling systems (for the electric motors, the battery and the interior) don't really need it. Inside, the cabin's very Jaguar-like, with big comfortable seats that come with faux-leather as standard and real hide at extra cost. You can even have wood trim if you want it. Ahead of the driver sits an all-digital instrument binnacle and the centre-dash infotainment layout is bespoke to the I-PACE too. As in the Range Rover Velar, it's a two-screen package, the upper part dealing with navigation, audio and 'phone functions and the lower part operating informational stuff you'll need less frequently. It's a comfortably five-seater and there's a decent 656-litre boot, with a further 27-litre compartment out-front. From launch, the I-PACE comes in one 'EV400' package with a 90kWh battery and a 395bhp all-wheel drive powertrain. There are three standard trim levels - 'S', 'SE' and 'HSE', with an additional 'First Edition' flagship variant offered during the first year of production. Prices start at around £63,500 and range up to around £81,500 - but of course from those figures, you can deduct the usual government £4,500 grant that applies to all full-EV models. Equipment levels are as generous as you would expect for the money being asked. Even the entry-level 'S' variant comes with 18-inch alloy wheels, full-LED headlights, sports seats, a Meridian sound system, a 'Navigation Pro' infotainment set-up, a rear parking camera, cruise control and heated door mirrors. 'SE' models add leather seats, a powered tailgate and power-folding mirrors. The 'HSE' gets a Meridian Surround Sound audio system, 20-inch wheels, Matrix-LED headlights, super-soft 'Windsor' leather upholstery and a 'Driver Assist' pack including adaptive cruise control and a 360-degree parking camera. The 'First Edition' version embellishes all that with a panoramic roof, a heated windscreen and Jaguar's ADAPTIVE Dynamics and Adaptive Surface Response driving modes, plus active air suspension. Inside, there's four-zone climate control, heated and cooled seats and a head-up display. Jaguar claims this car has a 300-mile range and that it can be charged to around 80% of capacity in less than 45 minutes, though only if you're fortunate enough to find a DC rapid charging point rated at 100kW (which is pretty unlikely at present). You're more likely to find a public 50kW charging point and using one of these, it would take 90 minutes to charge an I-PACE to 80% of its capacity. As an owner, you'll need to install a wallbox in your garage so you can charge the car overnight; a typical domestic wall outlet would take more than two days to charge the car from empty. I-PACE owners can easily find public charging points using connected navigation features built into the I-PACE's 'InControl Touch Pro Duo infotainment system'. As usual with EVs, Jaguar provides an app so that you can set charging times on your 'phone, so as to take advantage of low-cost electricity rates. What else? You get the usual unremarkable three year Jaguar warranty, though to be fair it does cover you for up to 100,000 miles. Should anything go wrong, Europe-wide breakdown assistance is part of the deal for three years.